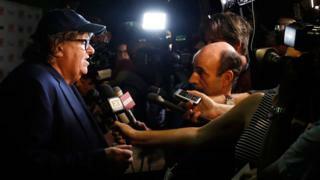 Oscar-winning documentary maker Michael Moore has said his latest film about Donald Trump is "a siren call" to a "despairing, dispirited public". Moore's film Fahrenheit 11/9 explores why Mr Trump beat Hillary Clinton in the US presidential election. Its title refers to 9 November 2016, the day of the election result, as well as his 2004 film Fahrenheit 9/11. His new film premiered at the Toronto Film Festival, where he said: "We are in a war to get our country back." The documentary film-maker won an Oscar in 2003 for Bowling for Columbine, about the 1999 Columbine High School shootings and US gun culture. A year later, he made Fahrenheit 9/11, about the presidency of George W Bush and the War on Terror. Variety's critic said Moore was attempting to use his new film to send a "warning" to US voters, urging them to "take action now". It includes footage of Adolf Hitler, using Mr Trump's words alongside videos of Hitler's rallies. The Hollywood Reporter said: "Moore insists he isn't making a direct comparison between Trump and Hitler but rather making 'a serious point about fascism'." It quotes the director as saying: "The fascists of the 21st Century will convince the people to go against their own interests by using television and branding. I don't think we should be afraid to call this out for what it is." In the film, Moore also returns to his home town of Flint, Michigan, where there was a water crisis in 2016 when lead was found in the water system. Screen International said the film "frustrates as much as it rouses, bouncing from topic to topic without fully digging into any of them". But The Wrap added that the film "grows slowly from an exhausting movie that is all over the map to a rousing one that makes a call to arms in troubled times". Another film making its debut in Toronto on Thursday was Netflix's Outlaw King, which was the festival's official opening night screening. Starring Chris Pine and set in the 14th Century, it is about the life of Robert the Bruce, the Scottish leader who led the fight for independence from England following William Wallace's death. Variety's critic Stuart Oldham praised the film, saying it "picks up where Braveheart left off". But The Hollywood Reporter was less complimentary, saying it was "something of a grind". Toronto gave Outlaw King a prime slot after Netflix pulled out of the Cannes Film Festival earlier this year in a dispute over whether participating films should have cinema releases. The Hollywood Reporter said Toronto was "the first time a major film festival has ever opened with a movie not slated for a major theatrical release". Meanwhile, the first screening of British director Mike Leigh's new film had to be stopped midway through due to an issue with its sound. The BBC's Neil Smith said an audience of press and industry delegates were left bemused as the dialogue in his historical drama about the 1819 Peterloo Massacre became muffled and indistinct. Following complaints, the two-and-a-half hour epic was halted and restarted after a 10-minute delay. Many audience members chose to leave rather than wait for its resumption. The film, which features Maxine Peake and Rory Kinnear, is set in and around Manchester, dramatising a peaceful pro-democracy demonstration in St Peter's Fields that was forcibly broken up at the cost of at least 10 lives. BBC Culture said the film was "purest Mike Leigh in the best sense" and "should resonate in the present".